Most of what you spend in marketing today, is hard to justify on a measurable return on investment calculation. Yet, I recently experienced a small investment which generated thousands of percents in real tangible return to the marketer, while driving up customer engagement and loyalty. Don’t believe me? Let me show you! 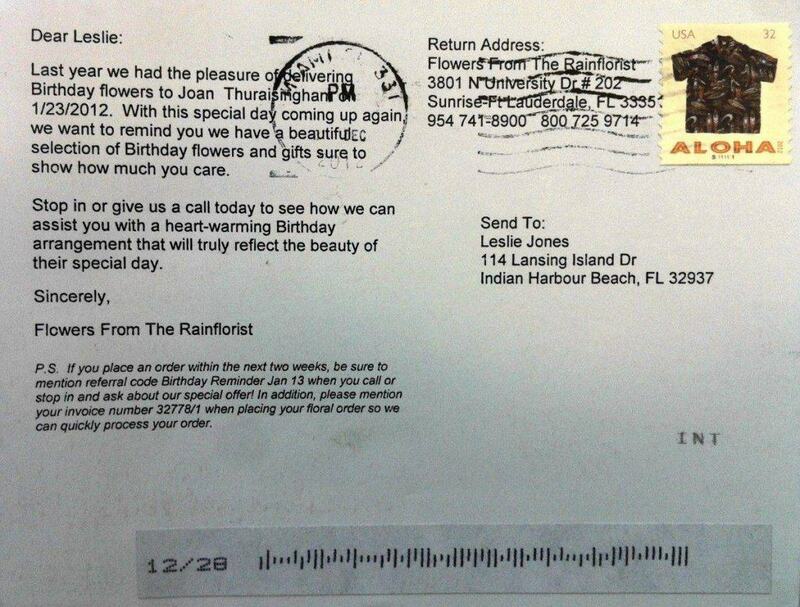 Last year we had the pleasure of delivering Birthday flowers to Joan Thuraisingham on 1/23/2012. With this special day coming up again, we want to remind you we have a beautiful selection of Birthday flowers and gifts sure to show how much you care. 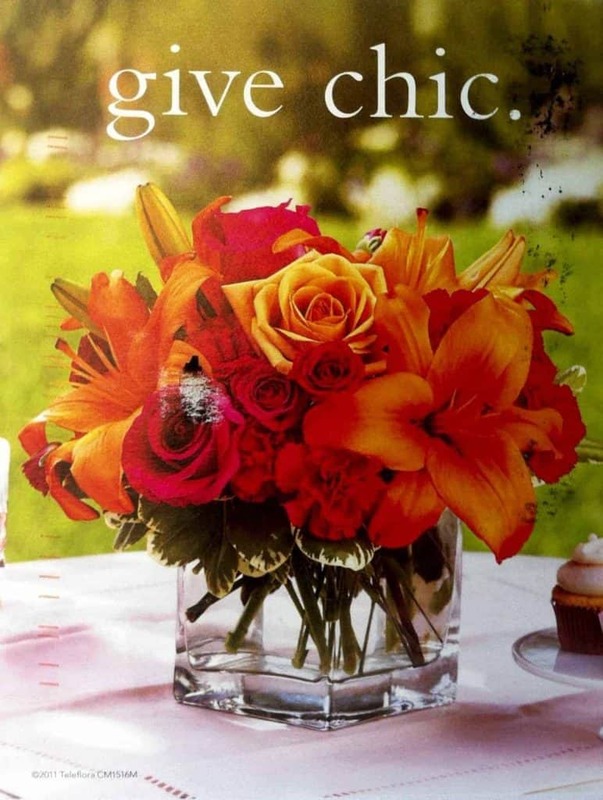 Stop in or give us a call today to see how we can assist you with a heart-warming Birthday arrangement that will truly reflect the beauty of their special day. P.S. If you place an order within the next two weeks, be sure to mention referral code Birthday Reminder Jan 13 when you call or stop in and ask about our special offer! In addition, please mention your invoice number 32778/1 when placing your floral order so we can quickly process your order. What were the keys to this successful low cost marketing investment? This low cost marketing pitch was so simple and yet so effective. It was a data based approach, and this business obviously found what is valuable to us as customers. They were rewarded for their creative customer engagement. Its amazing to me that more businesses don’t use this approach to engage their customers meaningfully. How many 50 cent low cost marketing solutions do you know that generate these kinds of returns? You can apply this approach to your business. Maybe its an email instead of a card, but whatever you choose, at the root is figuring out how to help your customers save valuable time! Try it, and watch the massive returns you generate. Post card reminder is a good and cost effective way to generate business, however email marketing cost you hardly few cents to reach at your client and it can be access from their smart phones. TGS Layouts is a real estate business and we mail our clients on every even occasions which give us 40% referral business every year. this piece gives hope to those entrepreneurs who are yet to make marketing budgets. your stories showcased that there are beautiful means a business can be spread.to me, post card are more efficient than messages wrapped in an envelop. thanks for this great shear. Great tips!!! I will try this method.Your tips is really very helpful and effective too.You have done a great job through this post .It is really a eye catching and valuable post to read. I think its is more about customer service or customer relationship than marketing, of course its easier to attract your current customer, anyway, that florist did an awesome action. Great information but more importantly a great story. The marketing approach the florist used is quite flawless because he also shows a sentiment of appreciation to the buyer since he remembered the last buy. Doing service events and other things like that are cheap ways to market yourself, I think. Thanks for posting all of these! I will definitely try this method. Thinking about doing seems a bit tiring. Its very fine.Thise blog provide very clear information for all investors . How we will use investment for our needful purpose. I think customers like to feel important and wanted. When I get a postcard with a message that was specifically written for me, I tend to pay more attention and thus become a repeat customer. I know that adding a small discount to the next purchase creates a positive incentive for the customer. Thanks for sharing, postcards are a great marketing tool. Catherine, Thank you for visiting and sharing your view. Like you, I pay a lot more attention to well personalized communications, rather than the mass junk. Come back soon. Great source of information. Thanks for sharing, this will be a great help to many people specially to those who are looking for low cost marketing investment. I’ve seen dentist offices use these frequently for annual check ups. Thanks for pointing out though that it has such high results because it targets past customers. Great advice. Thanks. Kevin, thanks for visiting and your comment. It’s amazing to me how this simple low cost old fashioned system can still deliver such great returns to marketers. I think it works well because it is targeted. Cheers! They are old fashioned in the sense they have been around for a while. But I think some steps could be taken to improve their results and bring them in to the present a little more. Adding a QR code to a postcard could have a big impact and make it more actionable. Kevin, that’s a great suggestion. Thank you for visiting and your comment. Come back soon. Hello Shivamber! This sound amazing! Any entrepreneur that are without a marketing budget do not have to throw in the towel yet. This example shows there are always ways and means to spread the word about your business. Sounds super effective! I think postcards are much more effective than mail packaged in an envelope, the potential customer actually sees your advertisement without having to do anything but pick it up. You are right and I think this can help properly if we know our vision of marketing properly and I think Blog posting is also a very effective cost efficient way to get traffic. Once you have created your blog, post all of your content onto your blog to help bring your blog page up on the organic Search Engine rankings. Once again, consistency and massive action is the key to results. Truly incredible way you have showed in here to invest low cost marketing! Actually as a business owner I always like this sort of strategy that you have given in here. So definitely I am appreciating with your concept about this low cost marketing investment and hopefully I will join with you very soon. Previous Post:Is a College degree really worth it?Next Post:Let's create a better future!